When anyone mentions the bookshops of Paris, thoughts immediately turn to the Shakespeare Bookshop, and it’s not surprising. If you’ve never been, you really should because it is undeniably lovely. 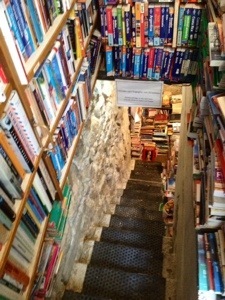 However, I offer up two other equally wonderful bookstores that are distinctly off the crammed tourist track. These two are enviously beautiful places and the chances are you’ll have them to yourself. Part two tomorrow, but let’s get started in the Latin Quarter. 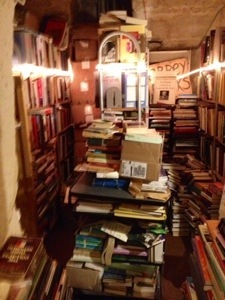 First up – The Abbey Bookstore Opened in 1989 by Canadian Brian Spence, the Abbey is a book lover’s dream with the thrill of towering books threatening to topple on you as an added bonus. Spence is very charming and helpful and seems to know where everything is. 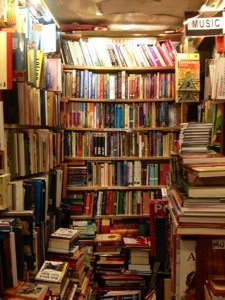 There are many treasures to be found here and the atmosphere is relaxed and easy, no rush as you squeeze your way through the maze of shelves. 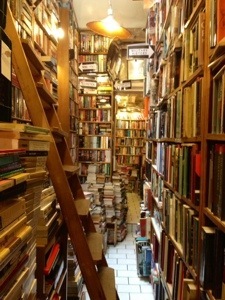 Leave the tourists behind and wallow in delicious booky dust here. 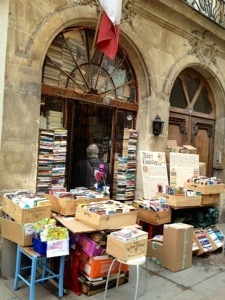 This entry was posted in Reading and Readers, Travel and tagged Abbey Bookstore, bookshops, Paris, readers, reading, travel. Thank you. I hope to help people find a few more hidden gems of your beautiful city. Take a look at my post Tardis Destinations – Part One, I think you might also enjoy that. More bookshops to come too!